This post is all about drink categories. Why I don't call it cocktail categories? Simply because cocktails originally were one respective category. Having in mind, that the idea is, about creating new drinks [or new drink variations], I am focussing on the most adaptable recipes. 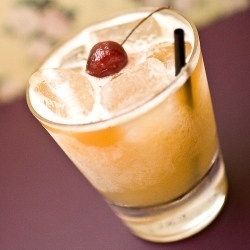 Sours are the work horse of all drinks. They are usually unfortunately not very high regarded - though if made properly, they can be a revelation in mixology - in the culinary world I would compare them with burgers/sliders. Sours only conventional strained have a lot of ice chards in them - that means, that these ice chips are melting on the tongue - which gives a great sensation - his however also means, that the drink becomes more diluted after longer time. Sours fine strained, usually are less frothy and don't have the special sensation. But they keep less diluted for a longer time. Unusual style: In a cocktail glass [only classic Daiquiri]. Due to the extra alcohol of the bitter orange liqueur, it is more suitable for lower proof spirits [ca. 40%]. Preparation as a sour - with the difference, that club soda is added at last. Less ice - used ice out of the shaker can be utilized. Collinses contain a lot of club soda. Proportions are the same as sours, fizzes. Usually built up in a glass with ice cubes. Large collins glass >40 cl. Rich syrup might be served separate, to allow guest to sweeten to his/her taste. Highballs are drinks, in high tumblers [...], which combine a spirit with carbonated sodas. One of the most important cocktails in all times! Usually served as aperitif or "blue hour drink"